This is part 25 of Categories for Programmers. Previously: F-Algebras. See the Table of Contents. If we interpret endofunctors as ways of defining expressions, algebras let us evaluate them and monads let us form and manipulate them. By combining algebras with monads we not only gain a lot of functionality but we can also answer a few interesting questions. One such question concerns the relation between monads and adjunctions. As we’ve seen, every adjunction defines a monad (and a comonad). The question is: Can every monad (comonad) be derived from an adjunction? The answer is positive. 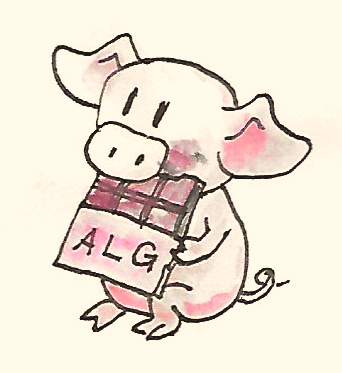 There is a whole family of adjunctions that generate a given monad. I’ll show you two such adjunction. If we look at f as a binary operator, this condition tells us that z is the right unit. The second coherence condition operates on a list of lists. The action of join concatenates the individual lists. We can then fold the resulting list. On the other hand, we can first fold the individual lists, and then fold the resulting list. Again, if we interpret f as a binary operator, this condition tells us that this binary operation is associative. These conditions are certainly fulfilled when (a, f, z) is a monoid. Since mathematicians prefer to call their monads T, they call algebras compatible with them T-algebras. T-algebras for a given monad T in a category C form a category called the Eilenberg-Moore category, often denoted by CT. Morphisms in that category are homomorphisms of algebras. These are the same homomorphisms we’ve seen defined for F-algebras. 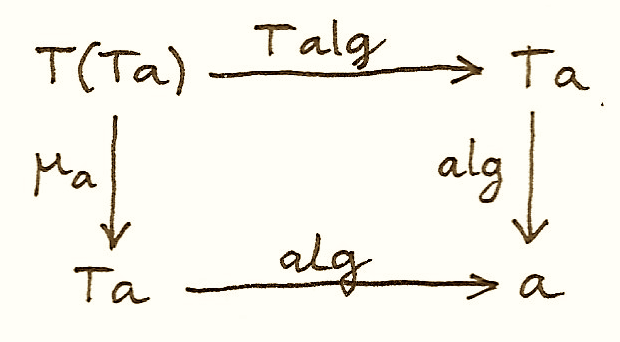 A T-algebra is a pair consisting of a carrier object and an evaluator, (a, f). There is an obvious forgetful functor UT from CT to C, which maps (a, f) to a. It also maps a homomorphism of T-algebras to a corresponding morphism between carrier objects in C. You may remember from our discussion of adjunctions that the left adjoint to a forgetful functor is called a free functor. The left adjoint to UT is called FT. It maps an object a in C to a free algebra in CT. The carrier of this free algebra is T a. Its evaluator is a morphism from T (T a) back to T a. Since T is a monad, we can use the monadic μa (Haskell join) as the evaluator. But these are just monadic laws, if you plug in μ for the algebra. As you may recall, every adjunction defines a monad. It turns out that the adjunction between FT and UT defines the very monad T that was used in the construction of the Eilenberg-Moore category. Since we can perform this construction for every monad, we conclude that every monad can be generated from an adjunction. Later I’ll show you that there is another adjunction that generates the same monad. Here’s the plan: First I’ll show you that FT is indeed the left adjoint of UT. I’ll do it by defining the unit and the counit of this adjunction and proving that the corresponding triangular identities are satisfied. Then I’ll show you that the monad generated by this adjunction is indeed our original monad. Let’s calculate the a component of this transformation. The identity functor gives us a. 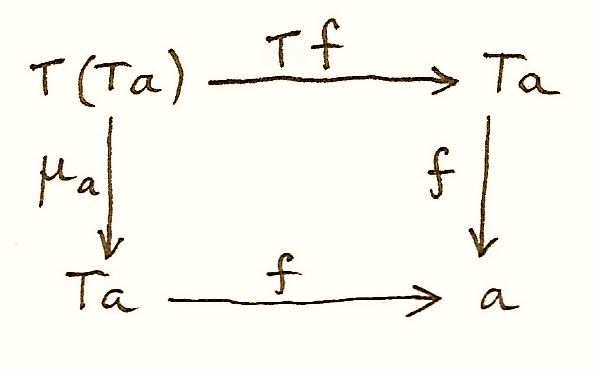 The free functor produces the free algebra (T a, μa), and the forgetful functor reduces it to T a. 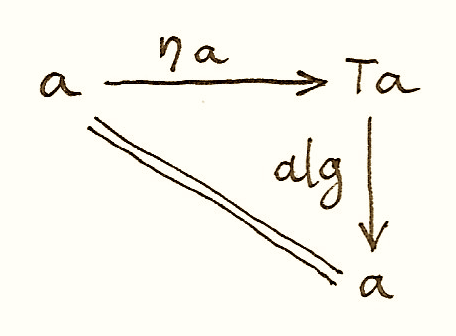 Altogether we get a mapping from a to T a. We’ll simply use the unit of the monad T as the unit of this adjunction. We have thus defined the component of the counit natural transformation ε at (a, f) (an object in the category of T-algebras) to be f.
The first one holds because of the unit law for the monad T. The second is just the law of the T-algebra (a, f). As expected, the unit of the adjunction is the unit of the monad T.
This is a horizontal composition of three natural transformations, two of them being identity natural transformations mapping, respectively, L to L and R to R. The one in the middle, the counit, is a natural transformation whose component at an algebra (a, f) is f.
Let’s calculate the component μa. We first horizontally compose ε after FT, which results in the component of ε at FTa. Since FT takes a to the algebra (T a, μa), and ε picks the evaluator, we end up with μa. Horizontal composition on the left with UT doesn’t change anything, since the action of UT on morphisms is trivial. So, indeed, the μ obtained from the adjunction is the same as the μ of the original monad T.
We’ve seen the Kleisli category before. It’s a category constructed from another category C and a monad T. We’ll call this category CT. The objects in the Kleisli category CT are the objects of C, but the morphisms are different. A morphism fK from a to b in the Kleisli category corresponds to a morphism f from a to T b in the original category. We call this morphism a Kleisli arrow from a to b. You may recognize this as the definition of monadic bind in terms of join. and their composition G ∘ F reproduces the original monad T.
So this is the second adjunction that produces the same monad. In fact there is a whole category of adjunctions Adj(C, T) that result in the same monad T on C. The Kleisli adjunction we’ve just seen is the initial object in this category, and the Eilenberg-Moore adjunction is the terminal object. and ε and δ are the two natural transformations defining the comonad (in Haskell, their components are called extract and duplicate). There is an obvious forgetful functor UW from the category of these coalgebras to C. It just forgets the coevaluation. We’ll consider its right adjoint FW. The right adjoint to a forgetful functor is called a cofree functor. FW generates cofree coalgebras. It assigns, to an object a in C, the coalgebra (W a, δa). The adjunction reproduces the original comonad as the composite UW ∘ FW. Similarly, we can construct a co-Kleisli category with co-Kleisli arrows and regenerate the comonad from the corresponding adjunction. Here, a is a value of type a. Notice that partially applied set is a function s->a. This is the lens law that expresses the fact that if you set a field of the structure a to its previous value, nothing changes. tells us that getting a value of a field that was set to s gives s back. In other words, a well-behaved lens is indeed a comonad coalgebra for the Store functor. What is the action of the free functor F :: C -> CT on morphisms. Hint: use the naturality condition for monadic μ. Prove that the above adjunction reproduces the original comonad. I’d like to thank Gershom Bazerman for helpful comments. With regards to the first of the triangle identities, don’t you need to show for all X in C that FX mapped to FGFX = FTX mapped to FX by (epsilon at FX) o (F.(eta at X)) is the same as the identity at FX? Isn’t the diagram given above looking instead at GFX =TX mapping to GFGFX = T.TX mapping to GFGX = TX (ie with G applied to each step)? Apologies if I’m missing something. and because Free Monads lead to some amazing programming as in ‘Data types a la carte’ functional pearl. In the expression (the second condition) “fmap colag ∘ coalg = δ_a ∘ coalg”, the word “colag” should be replaced by “coalg”. I was not mistake? You’re right. Fixed! Normally, free functor is the left adjoint to forgetful, so U.F is the monad and F.U is the comonad. But here F is not free, it’s cofree, so left is reversed with right. Good catch! It should be UT right?